Description: The Great Shelby Holmes may have finally met her match in this humorous sequel to Elizabeth Eulberg's fresh twist on Sherlock Holmes. Being friends with a super sleuth isn't easy, especially when she's nine years old and four feet tall, and full of attitude. But for eleven-year-old aspiring writer John Watson, being friends with Shelby Holmes is just the adventure he's looking for. In the few weeks since moving to Harlem with his mom, Shelby has been training John in the art of observation-a skill that comes in handy on the first day of school. John's new teacher, Mr. Crosby, is acting suspiciously, and Shelby knows this is a mystery worth investigating. But as Shelby and John dig deeper, they discover that there may be someone unexpected involved--someone who may have Shelby beat. 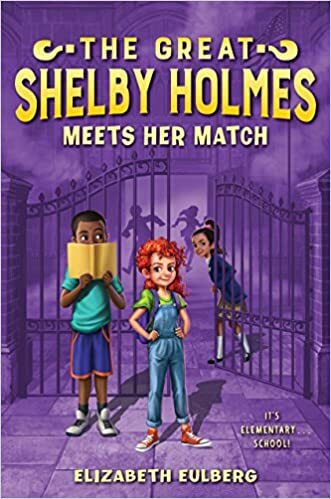 My Thoughts: In this retelling of the Sherlock Holmes story, Sherlock is Shelby, a nine-year-old genius who has been skipped two grades. Dr. Watson is John Watson her eleven-year-old sidekick. both attend a school for the arts in Harlem where John is focusing on writing. Like Dr. Watson, John tells the stories of Shelby's adventures but his medium is an online journal that is also a requirement of his creative writing class. Shelby and John met only recently when he and his mother moved into the apartment house were the Holmes family lives. Shelby was John's first New York friend. Even though Shelby doesn't feel that she needs friends, John is a good friend to her. He helps her connect with other kids who tend to avoid her otherwise. This case has to do with a suspicious new science teacher at their school. Shelby's investigations lead her to the conclusion that he has lost his grandfather's watch. Following the clues leads to the school that heavily recruited first grader Shelby and was the school where the teacher worked previously. There John and Shelby run into this story's Moriarty in the person of Moira who is jealous of the attention paid to Shelby and who is determined to outsmart her. The story has appropriate danger for a middle grade mystery that is made more timely by the fact that John is a diabetic. One plot point has them locked in a boiler room and John suffering a blood sugar crash. I found Shelby as annoying as most of the people around her do and appreciated John's attempts to socialize her. I liked the friendship that the two of them develop. I am eager to read more adventures for Shelby and John. Shelby pointed her finger at me. "There's something off about him. He looks at me in a weird way." WHO DOESN'T? I wanted to ask, but I bit my tongue. But seriously? I'd seen nothing but weird looks for Shelby from kids and teachers today. I received this review copy from the publisher. You can buy your copy here.